Yesterday, Motor Man had to run an errand in Chesapeake, and since Chesapeake is only about an hour from the Outer Banks…well, you probably can guess the rest of the story. Yes, we rode a little further south. 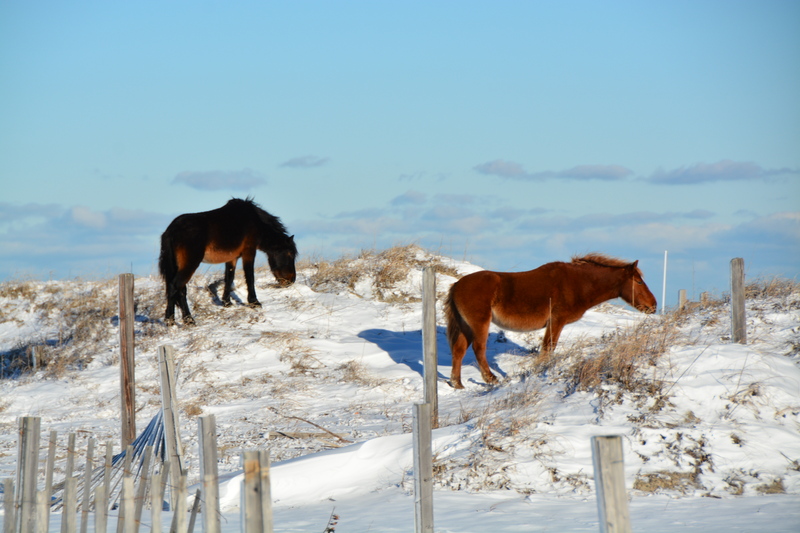 And we found beautiful horses, wearing warm, wooly winter coats, grazing on snow covered dunes. Seeing horses actually out ON the beach is always a gamble, but finding them on the dunes is second best. As you can see, the Outer Banks had a dusting of snow beginning Tuesday afternoon. The following video was posted on the Corolla Wild Horse Fund Facebook page yesterday. It’s a good thing the horses are wearing their thick winter coats. I can’t imagine seeing this in person. This entry was posted in OBX Wild Horses, Traveling Days and tagged corolla wild horse fund, obx wild horses, snow on the outer banks. Bookmark the permalink. 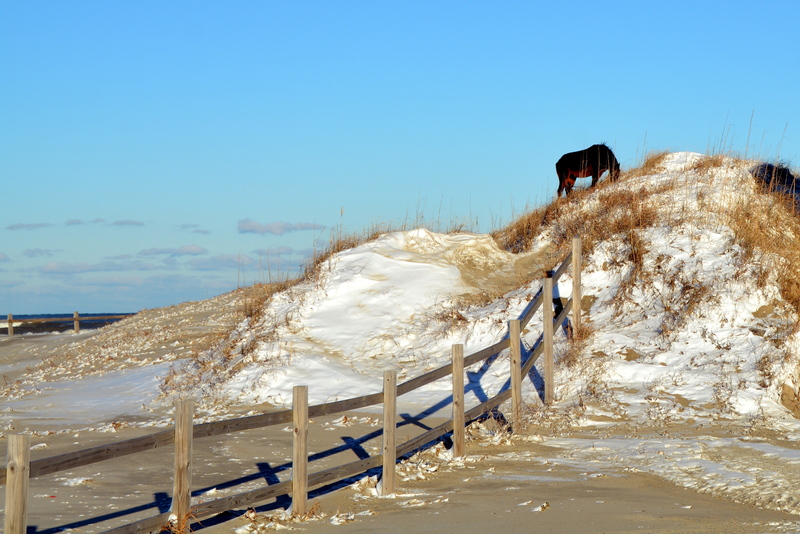 Well you had a beautiful sunny day to catch the horses on the dunes….looks cold but not nearly as cold as in the video in the driving snow. It never ceases to enchant me seeing your wonderful horses on the Outer Banks. The colors make even more magical. So bright and cold. That video is something else. Gorgeous, but oh so bittersweet. Bless the horses hearts. I would want to crochet them some warm winter coats to wear over their wooly winter fur. Oh…your first sentence sounds like the first line from that children’s book “If you give a mouse a cookie (next page)…he’s going to ask for a glass of milk (next page)…and if he asks for a glass of milk (etc).” Love the photo and loved the writing. I know they are able to handle that weather but it still seems a brutal windy cold for them. Horses here that have run ins hardly ever use them in brutal cold weather. They just keep moving and grazing. That surf sounds powerful and the wind! Love the video! Like that they have some bright sun.. 🙂 Cool post Dianna! AMAZING!!! Just Beautiful! Thanks for braving the elements to give us a morning lift. Just gorgeous. I can see why those wild horses captivate you. I mean the beach and horses, what could be better? Loved that video too! Thanks for sharing it with us. Horses playing in the snow. I wonder if they made snow angels!! Beautiful photos. Thanks for something to brighten this cold morning! Love the pictures, as always! What a amazing video of the horses in the snow! The colors of the horses in your pictures are “WOW”. Thanks for going out. Wow! I would have loved to be along for that drive! Great pictures!!! 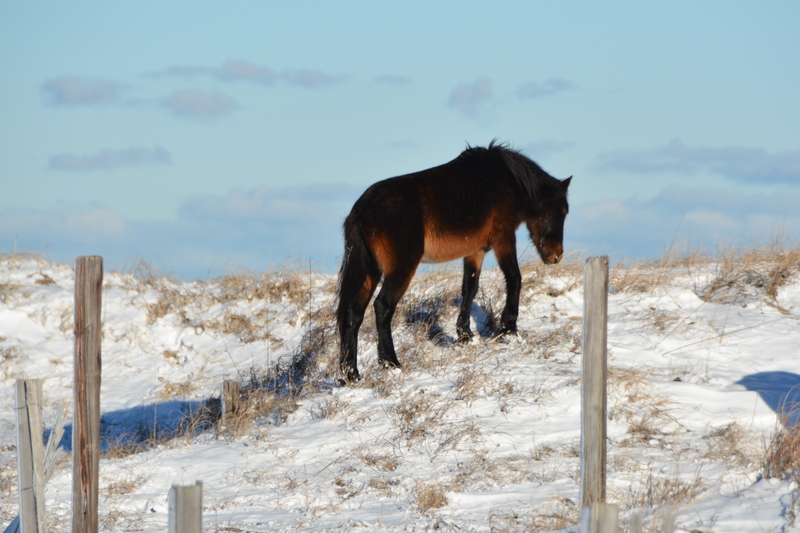 The beach just takes on a different quality in the snow – & those winter coats look so warm! Great vid, too ! Oh what wonderful photos Dianna! The horses look so calm and warm and even well fed and the beach takes on a whole new look in winter white. Oh Wow! We loves it! I like how the front horse in the video waited for the other to catch up. It does look cold! They look really sharp in their winter coats. So glad you had another opportunity to photograph the horses! 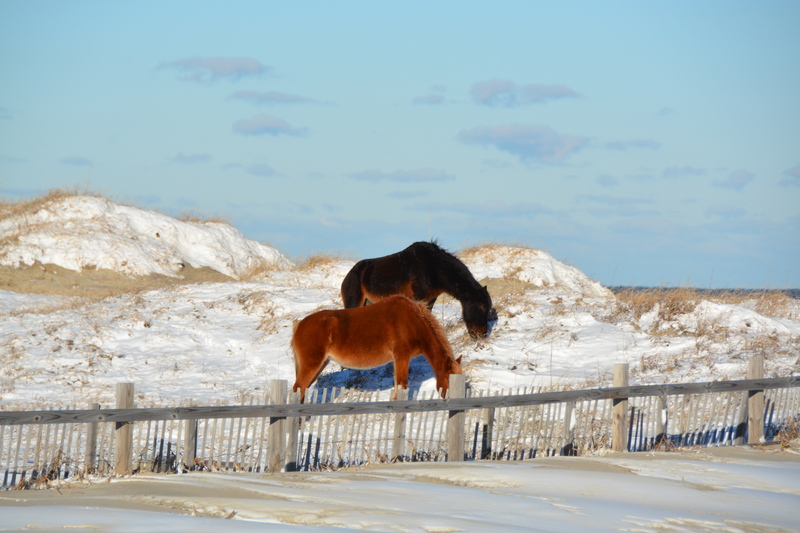 The shots are beautiful…the horses, the colors, the beach, the snow….I love it!